The urban areas may be exposed to different natural hazards; in order to jointly evaluate the potential risk, this article proposes a methodology for the qualitative assessment of the multi-hazard physical risk by using a fuzzy inference system called MuHRA by its abbreviations MUlti-Hazard Physical risk assessment. This methodology is based on the fuzzy sets theory and uses expert opinions. It is applicable to the risk evaluation involving a maximum of three natural hazards and uses five levels of risk: very low, low, medium, high and very high. The proposed methodology considers the physical risk in an urban area involving at least three potential effects: predominant damage that varies with the type of hazard; impact on the population, and damage in lifelines. According to the available information for the urban area to be assessed, the physical risk to a natural hazard can be evaluated, either through expert opinion or a more detailed assessment, and then they are combined and synthesized into a single multi-hazard physical risk index (RFmh). The MuHRA methodology is applied to the multi-hazard risk evaluation for the city Merida-Venezuela considering both, the seismic hazard and the landslides. This application shows the versatility and robustness of the methodology, which can be adapted according to the information available in each case study. 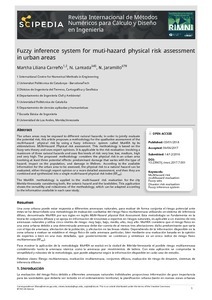 Carreño, M.L., Lantada, N., Jaramillo, N. Fuzzy inference system for muti-hazard physical risk assessment in urban areas. "Revista internacional de métodos numéricos para cálculo y diseño en ingeniería", Gener 2018, vol. 34, núm. 1, p. 1-13.